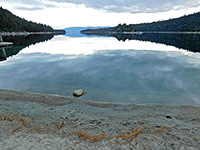 One of four state preserves along the west edge of Lake Tahoe, Emerald Bay State Park protects the most spectacular and scenic section of the shoreline - a narrow, steep-sided inlet beneath the high peaks of the Desolation Wilderness. 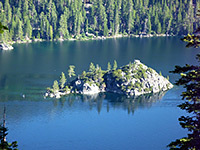 At the center is Fannette Island, the only such feature on the lake, rising just 150 feet above the greenish blue water, and sparsely covered by fir trees, growing amongst granite crags. 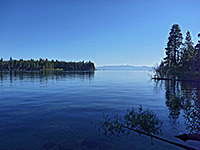 The view of the island, looking down the bay and across to the hills on the Nevada side of the lake is one of the most photographed in the Tahoe area, and may be appreciated from two overlooks along Hwy 89, or close up via a one mile trail that descends 500 feet to the shore. The state park contains the bay, its two headlands and a strip of the forested slopes at either side, and adjoins DL Bliss State Park to the north, together forming a continuous preserve six miles in extent. 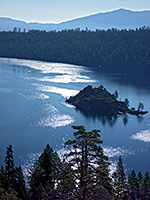 The underwater environment is also part of Emerald Bay State Park, and includes a number of sunken ships. 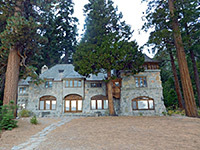 One other, rather anomalous attraction, is a replica Scandinavian castle (Vikingsholm), constructed as a summer home by a wealthy Santa Barbara resident early in the 20th century, while the park also has a popular campground and a hiking trail, running all around the bay and continuing into DL Bliss State Park. 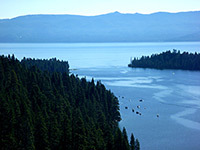 The south shoreline of Lake Tahoe is quite flat, and CA 89 from South Lake Tahoe crosses a mix of forest and grassland before climbing quite sharply as the ground rises towards Eagle Point, a promontory forming the south side of Emerald Bay. The first section of the state park is on the north side of the highway just after a set of switchbacks, where a side road forks off to the campground, in two sections (upper and lower), both close to but generally out of sight of the lakeshore. A fee of $8 is charged here for day use but there is little of interest for non-campers, who are only allowed to drive a little way down the access road, as far as the parking area for the Rubicon Trail. This path heads west, initially still through woodland but eventually descending towards the shore, and giving good views of Fannette Island before passing Vikingsholm then tracking all along the north shore and continuing into DL Bliss State Park. At Eagle Point there are no proper views of the lake or bay until the far end of the campground road, a walk of about 2/3 mile for day use visitors. 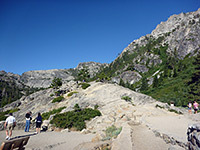 Hwy 89 next reaches Inspiration Point, a northwards-facing overlook where the views of Emerald Bay and the island are somewhat obscured by trees but are still impressive. The point lies just outside the state park hence no parking fee is charged, unlike the main area one mile further; the section between actually has the best views but there are no official stopping places, just a couple of narrow pullouts. The next parking area is for the Vikingsholm Trail, and again a charge is due, though the majority of people don't pay, and stay just for a few minutes, for the very short walk to a viewpoint of the bay, on a treeless granite dome; a scene best photographed in the afternoon or evening. This location is just opposite the busy parking area at the Eagle Falls Trailhead, which also requires a fee, though not if parking along the roadside.